Fascinated by eighteen century repertoire, Antoine TORUNCZYK soon specialized in early oboe performance practice, first in the Conservatoire National Supérieur de Lyon under guidance of Michel HENRY, then in Amsterdam’s Sweelinck Conservatorium, with Alfredo BERNARDINI. He graduated in 2000, and the same year he obtained the First Prize in the baroque oboe competition in Halle (Germany). A free lance musician since 2000, he frequently collaborates with many of the main period instruments orchestras in Europe, and plays principal or co-principal oboe in Amsterdam Baroque Orchestra (T.koopmann), le Concert Français (P.Hantaï), Anima Eterna (J.van Immerseel), La Chambre Philharmonique (E.Krivine), Concerto Köln, Les Agrémens (G.van Waas), La Grande Ecurie (J.C Malgoire),among others. 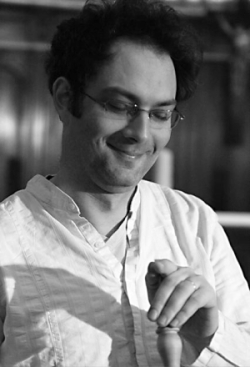 Antoine is also a very active chamber musician, and founded in 1996 his own ensemble, l’Assemblée des Honnestes Curieux. The ensemble has been awarded in the Premio Bomporti Early Music Competition in Rovereto (Italy). Their recordings of Marin Marais’ Pieces en trio and G.F.Handel’s Sonata’s of severall parts or J.F.Rebel Sonates have been praised by international critics, and since 2002 the ensemble is exclusively recording for the french label ZigZag Territoires (distr. Harmonia Mundi). As a soloist, Antoine Torunczyk has also recorded J.S.Bach concerto for oboe d’Amore (Alpha, 2001) and double concerto for violin and oboe with french violonist Amandine Beyer (Alpha, 2003), both accompanied by Cafe Zimmermann. His most recent recording, devoted to Pierre Danican Philidor Suites together with Alfredo Bernardini and l'Assemblée des Honnestes Curieux, is planned to be issued in February , and already attracted the interest of the critics (choice of France Musique). Antoine is currently teaching early oboe in the Early Music Department of Toulouse conservatory.